The heart and soul of Geomancy is the casting and reading of Geomantic Charts. Geomantic Charts have the same function as Charts in Astrology and Spreads in Tarot. They are the medium through which the reader interprets the messages of the animus mundi, or consciousness of the world. Like with Tarot and Astrology, Geomancy relies upon the interpretation of symbols laid out in certain patterns before the reader. The interpretations of the symbols – in the case of Geomancy, the sixteen Geomantic Figures – is done through conscious thought processes while in a state of open-mindedness, allowing you to receive influences from your subconscious, bringing them to your consciousness’ attention. Your subconscious, in turn, is influenced by the animus mundi, which can help guide you in your interpretations if your mind and soul are willing to listen. Geomancy is much simpler than most systems of esoteric “divination,” and requires almost no materials. All that you need is a way to generate a random number from one to two. You can do this by tapping on the ground and counting odd or even, by drawing cards from a deck, by rolling dice, by flipping coins, or by any other completely unbiased process. Personally, I use special Geomantic dice I made: four dice in the colors Red (Fire), Yellow (Air), White (Water, should be blue but I couldn’t find a blue die of the same style), and Green (Earth). On each die I drew either one dot or two dots, so that there were three of each. In order to generate one Geomantic Figure, I roll all four dice and arrange them in order to generate a Figure. For example, if I roll a 2 on the Red, a 2 on the Yellow, a 1 on the White, and a 2 on the Green, I have generated the figure Albus. Like with Tarot spreads, there are multiple Geomantic charts that one can use depending on the question asked. Depending on the chart, methods of generation are different, but most charts are based off of the Shield Chart. To generate the shield chart, the very first thing you must do is formulate the question you wish to ask, just like in a Tarot reading. The process can be found in this post. Clear your mind and prepare yourself for the task at hand in whatever way you wish. I personally focus on my inner self and my connection to the animus mundi, and call upon both of them for guidance. I think of the question I seek an answer to and keep it in my head. Once I am ready and I am sure that my mind is receptive to any answer and will not lean towards a biased interpretation, I draw the chart itself, as seen here. I then generate the first figure and write it in the upper right-hand slot. Then I generate the second, third, and fourth Figures – the Mothers – and place them in their proper places, before then using those symbols to derive the remainder of the chart (a process which will be discussed in a later post). Once that is done, you have the basis for a Geomantic reading. 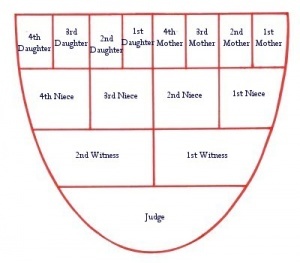 There are ways to interpret the Shield Chart directly (a process discussed here), and once the Shield Chart has been interpreted, other charts (such as the House Chart) can be generated from it, to further shed light on the situation. Like with any other esoteric reading, when interpreting the chart, it is important to evaluate both the meaning of the Figure and its specific Position in the Chart. The two of those combined together. The Figure represents the energy, and the Position represents how it manifests. The House Chart can also help you explain where the energy manifests in your life. Unlike with Tarot, a Geomantic chart is easy to finish. Generally, thanking the animus mundi and your inner guide for their guidance is a good plan, and generally after that all one needs to do is put away he materials and move on. As a word of caution, the weather around you and the world’s environmental state can sometimes affect the results of a Geomantic reading. The purest results are achieved in a place far from the clutter of human civilizations, during a clear and sunny day. Troubled weather indicates that the animus mundi is troubled, and pollution in the body of the world – or corpus mundi – can also influence the interpretation of a reading negatively. This entry was posted on June 6, 2012 by Z. M. Wilmot. It was filed under Geomancy . how would i predict if a team would win a certain match? Generally I would not recommend using Geomancy (or Tarot) to predict the future in this way; both of these arts tend to do poorly in answering simple Yes/No questions, and neither of them can really predict the future; instead, they help you think through issues and help give you insights you might not otherwise have had. If you wanted to ask what factors might be most relevant in a team’s next match, that type of question might get you a more interesting and helpful answer. Hello , Im practically new on all this, do you think anyone can be able to achieve the Geomancy reading? Yes, absolutely! Anyone can learn to read and generate the charts; it just takes practice!